Guys like Kareem Osgood and Chris Baker amuse the heck out of me. They are upset that they aren't starting and aren't getting starting money. So to rectify this, what do they do. Of course! Don't show up to camp! Please tell me how forcing a coach to design plays and practice plays where you aren't involved is the way to get starter money, dudes? So Herm Edwards says he's going to "take it easy" on Larry Johnson. Yeah, right. He said that every year, and by halftime of game one, he had run about 25 plays for Curtis Martin. So, pardon me if I call "Bull!" on Herm. He drives his running backs into the ground. Always has, always will, no matter what he says in May. The Milwaukee Journal Sentinel surmises that if the Brew Crew are out of it by July, they might try and trade Ben Sheets. If that's the case, I think the Yanks should take a good look. Not saying we should sell the farm for Sheets, but he might be had for considerably cheaper than Johan. Say, Melky, Chase Wright and maybe a low-level prospect? 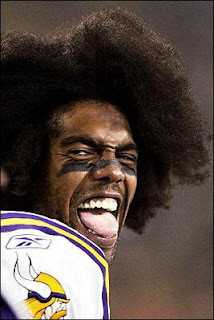 And what's with the players in the NFL complaining about having to cut their hair because a new NFL policy might force them to. Oh, boo hoo. "I used to have long hair," says Packers tailback Ryan Grant. "It's someone's right, and for some, it's part of their religion or culture." Oh, spare me. Says Dhani Jones, "There has to be a limit to what they can control. Next, it'll be how long your fingernails can be or how white your teeth are." Yeah, maybe they will...because they are paying you. This is a job. And if your boss wants you to wear a suit, cut your hair or look presentable, you do it if you want to get paid. You don't like it, the world needs some checkout baggers. So, Vince Young is saying that he almost retired after his first year. Listen to the sad..."It was crazy being an NFL quarterback. It wasn't fun anymore. All of the fun was out of it. All of the excitement was gone. All I was doing was worrying about things." Yeah, I'm sure it was real tough, Vince. But once again, ANDAPLAYERTOBENAMEDLATER calls "Bull!" A couple of days without the monster checks coming in and I think ole Vince would have rediscovered how much he really loves being a QB and what that can bring you. As we can see by this picture, he really, really, does love it. Still, it must be reassuring to the Titans that their franchise QB is kind of a flake. Hey, just heard this little tidbit. When that first night game was played 73 years ago, just over 7 million fans attended major league games each year. Today, attendance is more than 10 times that figure with over 76 million people filling the seats at stadiums around the country annually. So if anyone starts complaining they miss the "Golden Age" of baseball when fans were real fans, you tell them we're living in it now. And last, ANDAPLAYERTOBENAMEDLATER Man of the Week Award goes to Jay Cutler. Recently, Cutler revealed he has diabetes and lost 35 pounds last year. And not only are teammates impressed with his business-as-usual demeanor, but in continuing to play, he has inspired fans. He has gotten 500 emails from fans saying they support him, many from kids who say they have it too. "A lot of kids get diagnosed each day who are under 8," says Cutler. "I can't imagine their parents having to wake their 3-year-old up three times a night to prick their finger to check their blood sugar level. Cutler will practice with an iPod-sized insulin pump to regulate his blood sugar. "Guys look at Jay and the way he's handled things and their problems don't seem half as bad," Champ Bailey says. "I'm amazed at the way he's handled it. I thought he'd be freaking out right now. But he hasn't shown one sign of emotion. He hasn't missed a workout. Jay's a natural leader. He gets it." "When I get things settled, I want to do something to help raise awareness, especially with kids," Cutler has said. And for that, he gets the Man of the Week award. And Bailey is right. He does get it. Norm Cho0w couldn't make Vince Young a better QB. That's bad - Norm Chow coached Steve Young, the Detmer brothers, Philip Rivers, Matt Lienart and Carson Palmer in college, and made all of them better QB's. 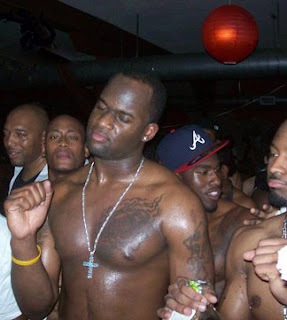 I think Vince Young actually regressed. That should make Titans fans uneasy. I'll take Ben Sheets - not for Melky, though. I like having a solid center fielder, and they don't grow on trees. I like Melky too, but we have a couple of nice prospects down on the farm; a couple of blue-chippers named Austin Jackson as well as Jose Tabata, as well as a nice leadoff-type named Brett Gardner. For Sheets, i might give up Melky. I think Vince will be showing up in a blog entry I have planned for this weekend. Stay tuned.